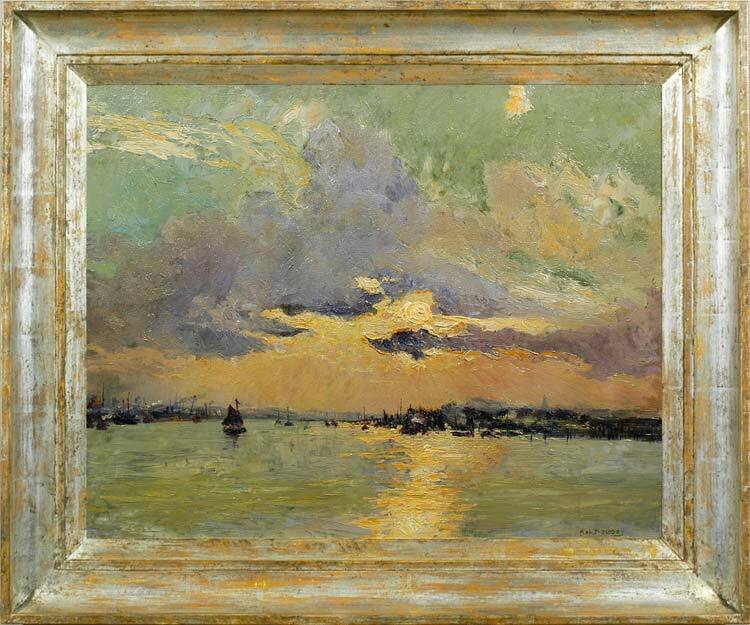 A masterly and sophisticated coastal seascape, this painting of a sunset over a river mouth in Belgium manages to be at once impressionist and expressionist. Boudry captures the torn clouds and failing light at a precise moment, when the huge open skies of the Netherlands fade into a harmony of greens, greys, mauves and peach. He also summons a profound air of tranquillity, tinged with a melancholic sense of transience and loss, which may be rooted in the date when this was painted, the year in which the First World War ended. It is a work in the tradition of Boudry’s 17th century Netherlandish predecessors, such as Simon de Vlieger, Jan Porcellis and Willem van Diest: the same low horizon, the same quality of golden light, the same play of light and shade between the vast cloudy sky and the water; yet it manages to be simultaneously completely modern and fresh.